Probably everyone has suffered from ground-loop hum problems at one time or another, perhaps when trying to get audio out of a laptop. The problem occurs when there are two or more 'ground' paths between the source and destination equipment, such as between the equipment mains safety earths and the grounded screens of the audio cables. A small current can flow around this 'loop' and generate audible hums and buzzes. The simplest and safest remedy is to break the ground path through the audio connections, and that requires a transformer isolator. The audio signal passes between the electrically isolated primary (input) and secondary (output) windings of a transformer as an alternating magnetic flux. The electrical isolation between the windings means that the signal ground of the destination equipment is no longer connected directly to the signal ground of the source equipment. Hence the 'ground loop' is broken and the problem is overcome. There are lots of transformer isolators of varying quality, and at a range of prices. The designer's challenge is to find a transformer that can handle the full potential dynamic range of line-level signals without imposing significant distortion, while maintaining a wide and flat frequency response. Lower-cost units often saturate and produce significant distortion when trying to accommodate the kind of signals levels that a professional D-A converter can throw out (+24dBu or more!). I've used many different line isolators, from the very expensive Lundahl-transformered Canford Audio Line Isolator, down to the very cost-effective ART Cleanbox 2. The former is measurably better than the latter, although in all but the most demanding applications the practical difference is subtle. 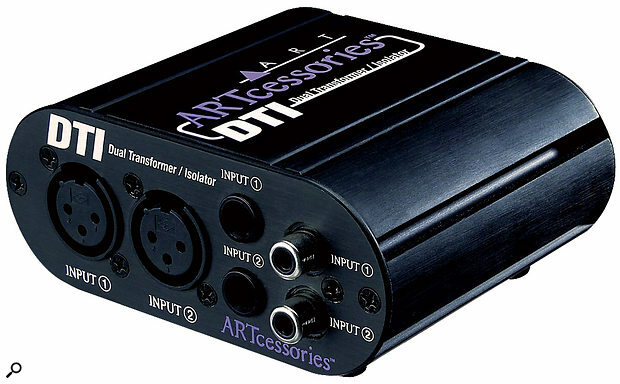 Recently, though, I needed a stereo line isolator with some flexibility in connection formats, and that lead me to ART's 'DTI' Dual Transformer Isolator, which is exactly what its name suggests: a dual-channel device that accepts two line-level inputs and provides two transformer-isolated outputs. It doesn't care whether the inputs or outputs are balanced or unbalanced: conversion is automatic and lossless. The DTI is constructed from a very sturdy extruded aluminium case with elegantly rounded edges, and is finished in a tough black enamel paint, with easy-to-read white legends on all the sockets. It measures 107 x 45 x 89 mm (whd), weighs 340g, and the internal construction is to good standards using Taiwanese transformers and connectors. Each input and output has RCA phono, quarter-inch TRS and XLR connectors, and these are wired in parallel. The nominal 'ground' terminals of almost all the connectors are isolated from the case metalwork, but the sleeve of the TRS socket and pin 1 of the XLR for the channel 1 inputs are grounded directly to the case. A thoughtful inclusion is a screw terminal for an external ground wire. Testing the DTI on my Audio Precision system, I found the transformer bandwidth to extend between about 30Hz and 70kHz (-0.5dB limits), and there was no evidence of saturation or any bandwidth restrictions, even with +20dBu input signals. The insertion loss (signal attenuation) through the unit is inherently dependent on the output loading impedance, but was typically between 0.1 and 0.5 dB, falling to about 6dB if connected to something with an antiquated input impedance of 600Ω. Crosstalk between channels at 10kHz, even with a hot +20dBu signal, was a very respectable -86dB. Distortion, naturally, becomes worse with higher levels and lower frequencies, and is mostly third-order, with some higher odd-harmonic components. Worst-case distortion reached almost 0.5 percent for a very challenging +20dBu at 50Hz, but was comfortably below 0.1 percent for all frequencies above about 150Hz with the same input level, and below 0.01 percent above 1kHz. The phase shift through the DTI swung roughly between +5 degrees at 20Hz to -5 degrees at 20kHz. All in all, these are very acceptable results for such an affordable unit. In fact, I was so impressed that the DTI is now permanently in my problem-solving kit box. Highly recommended.